NBA teams can assign players with less than three years of service to their NBA G League affiliates an unlimited number of times throughout the season. The NBA team maintains the assigned player’s rights and can recall that player at any time. Last season, an all-time high 101 players were assigned to the NBA G League – including 13 first-round picks from the 2017 NBA Draft – a total of 435 times. 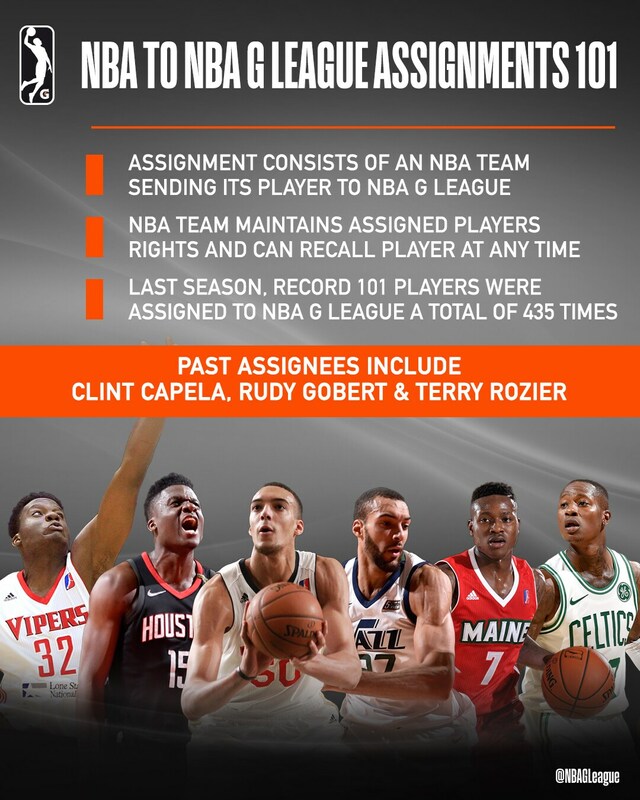 Past assignees include Rudy Gobert (Jazz to Jam, 2013-14), CJ McCollum (Blazers to Stampede, 2013-14), Clint Capela (Rockets to Vipers, 2014-15), Terry Rozier (Celtics to Red Claws, 2015-16) and Pascal Siakam (Raptors to Raptors 905, 2016-17). Click here for the list of NBA assignments from past seasons. The three NBA teams without NBA G League affiliates can assign players through the flexible assignment system. Click here to read more about the flexible assignment system.